One small thing can make a big difference in a photo. It was the last day of a short trip to chaotic, crazy, dirty, and thoroughly exhilarating New Delhi, one of the best places I’ve ever been for photographing people on the street. The sun had already set on a long, sweaty afternoon of wandering through a sweltering sprawl of dusty streets teeming with people, vehicle horns blaring so frequently that they all seemed to blend together into one, never-ending honk, and a new, unfamiliar mix of aromas around every corner (a few of which, I should clarify, smelled delightful). I had been feverishly trying to capture as much as I could, but the available light necessary (for shooting moving subjects outdoors with the limited equipment I had with me) was fading fast. I was absolutely desperate for a shower to wash away the grime, a seat to give my aching feet and back a rest, and my last chance to dine in India before flying out in the middle of the night, but since I wasn’t really satisfied with what I’d snapped so far, I decided to keep trying just a while longer. I figured I wouldn’t get any keepers, but at least I might waste less time wondering later I might have missed, as I often do. 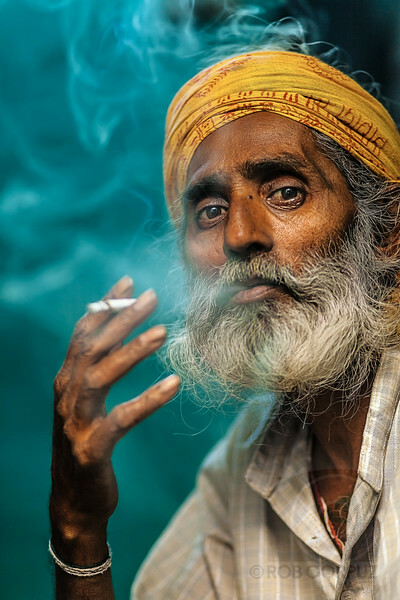 And so I came across this gentleman, sitting at the entrance to what I assume was his home, leaning against the door frame, nonchalantly blowing whirls of smoke into the air, and knew immediately that I just had to get a shot of him. Awesome beards like his aren’t hard to find in India, but he also had a striking face that was intense yet kindly. In addition, the blue-green wall directly behind him was lit reasonably well, and contrasted nicely with his skin tone and bright yellow pagri. The Indians I’d come across so far were generally more receptive to a stranger asking them for a photo than I’m used to, and thankfully, when I approached him, he smiled agreeably and immediately slipped into a standard pose. Unfortunately, his face was mostly in shadow, and I knew I’d be pushing my luck to get enough sharpness and exposure without some additional lighting (or asking him to move inside). Luckily, there was a bit of an overhang just outside the door, which I hoped would allow me to swivel my on-camera flash upward and bounce some light off it and back down on him. The first frame was still too dark, so I made a couple of quick adjustments to the camera settings. I’d already set the aperture wide open at f/2 to let as much light in as possible and get that background nicely out of focus and keep the emphasis on his face, and I didn’t want to go higher than ISO 400 in order to keep noise levels as low as I could, so I bumped up the amount of flash and dropped the shutter speed to 1/80th of a second, which is slower than I usually shoot, since my hands aren’t as steady as I wish they were. The next frame was still slightly darker than ideal, but I decided to stick with the same settings, thinking that the risk of increased noise by brightening the exposure in post-production was preferable to the risk of not getting any sharp frames due to a slow shutter speed and/or killing the mood with too much flash. I usually keep a 1/8 CTO (amber) gel on my flash to add a touch of warmth to the subject, and if I remember correctly, I think I added another warming gel so that by adjusting the white balance I could keep his skin color natural-looking but cool off the background even more and add more contrast. After getting the settings sorted out as best I could, I fired off a few frames and took another look at the screen. There were at least one or two reasonably sharp, well-composed shots with nice, neutral expressions on his face. Not wanting to overstay my welcome, I briefly considered showing him the back of the camera, thanking him, and moving on… but the photos were just… decent. Nothing more. Something was missing: his cigarette. He’d moved his hand away from his face and out of the frame while posing for the camera, and while I’d noticed it at the time, I figured it might be too cliched to show him exhaling trails of smoke anyway. I’ve seen that picture before many times. However, after looking at the camera, I realized that the gesture of smoking was an important part of the visual presence the drew me to him in the first place (along with the backlit smoke in the air), so I asked him if I could take just a couple more photos with him smoking. His eyes twinkled and he brought the cigarette up and started puffing away, immediately appearing more comfortable and natural, while giving the camera a look of gravitas. The interior lighting backlit the wisps of curling smoke, and I composed the shot so his eyes and hand would align roughly with two rule-of-thirds intersections, creating primary and secondary points of interest. This one small change made a big difference in improving the photo. When I showed the man the shots I had taken, he flashed a big grin and shook my hand, and I thanked him and went away, deciding that I might as well give myself another few minutes to keep shooting. While I’m certainly not advocating smoking in general or putting cigarettes in the hands of portrait subjects just to add some kind of “cool” factor, making the person you’re photographing feel comfortable is a critical aspect of getting a great shot. If the subject feels awkward, distracted, or annoyed, the viewer of a portrait can feel it, even if the visual differences appear minor. Two photographs taken a split second apart may look identical at first glance or when squinting, but looking a bit closer can quickly reveal that one is a keeper, and one can be deleted or at least banished to the back-up hard drive. When I reviewed the photos I’d taken of this man later on my computer, I found that all of them had at least one problem: either the focus on the closest eye wasn’t sharp enough, or he was in the middle of blinking, or his face was too obscured by smoke. Although I do think this super-smokey version looks pretty cool, it’s less of a portrait because the tonal contrast and lines become the main interest, as opposed to the subject. All of them had more noise than I would’ve preferred. The shot at the top of this post was the best of the set, but it could’ve been even better. I wish I could go back in time and make just one more shot. Still, I do like it. There’s color and tonal contrast, at least two points of interest that draw the viewer’s eye, and most importantly, the subject is interesting and when looking at him I can sense that he feels confident and at ease. Again, a comfortable subject is crucial to a good portrait. On the other hand, as always, in photography, there are exceptions to every rule. Before he became acclaimed as one of the greatest portrait photographers of all-time, a young Yousuf Karsh (check out his amazing self portait) was waiting to photograph British Prime Minister Winston Churchill, who had just finished a historic speech to the Canadian Parliament. Holding a glass of brandy in one hand, and a Havana cigar in the other, Churchill was directed by his handlers into the Chamber of the Speaker, where Karsh had set up an enormous amount of photo equipment the night before. When Churchill grimaced and asked grouchily about why there were floodlights everywhere, Karsh realized that he had not been told about the shoot, and said, politely, “Sir, I hope I will be fortunate enough to make a portrait worthy of this historic occasion.” Churchill angrily banged on a table and told him, “Two minutes for one shot, and I mean two minutes for one shot.” Thankfully, Karsh had prepared well for the technical aspects of the shoot, having already done test photographs with a model who resembled the “British Bulldog” (from the neck down), but he was still nervous. Churchill later shook the Karsh’s hand, saying, “You can even make a roaring lion stand still to be photographed.” Karsh’s first shot, with the Prime Minister’s irked, furious expression, was sold to Life magazine and catapulted the photographer to fame. He named it “The Roaring Lion,” and the portrait became the definitive, iconic image of Churchill, and one of the most reproduced photos of all-time. So as I was saying, there are exceptions to every rule in photography, but I still think it’s safe to say that most of the time, making the subject feel comfortable gives a better result. It’s interesting to note that Karsh has said he actually prefers a photo a taken shortly after the first, where Churchill is smiling. Sometimes, a cigar(ette) is more than just a cigar(ette). While a good photographer still needs to invest time into mastering his or her craft and approaching every shoot prepared, sometimes little, unexpected things can make a big difference in photography. A few more minutes of wandering the street with your camera. One turn of a camera knob or tiny tweak of the shooting angle. A smile or a carefully phrased request. A slight adjustment of pose or upturned corner of the mouth. One more shot.